I was recently selected to test the women’s Gardenia Dress by Cali Faye Collection. I was so thrilled to get the email that I had been selected since I love her designs! Knowing I would be on a serious time crunch, my husband was flying in for 4 days (He's moved for business, we will eventually join him), I set to work right away. I was surprised at how easily the dress came together. As I have said many times before, I am mainly self taught and I generally only sew for my kids, but the instructions were clear and easy to follow. One of the things that impressed me the most was how not "homemade" it looked. This is my biggest fear sewing for myself and what has held me back from doing much of it in the past. Kids look cute in homemade, moms look frumpy. This is not the case at all with the Gardenia Dress. It is well crafted to look professionally finished and stylish. I used a sturdy jersey knit with lots of stretch and 100% recovery. I was actually so impressed that my local fabric store had a great weight and colour in the fabric I was hoping for (this is not always the case for this store). I selected a midnight blue colour with flecks of black with the hopes of styling this dress with boots and possibly a scarf here in Toronto for the colder weather or flats and a clutch when our family moves permanently to Florida. Sarah was so gracious and sweet to work with, and responded so quickly to any questions I had during construction. My only complaint with the pattern would be that the neck seemed rather large. I am fairly flat chested so I have this problem a lot and felt as though I could have maybe gone down a size in the top section. The design is to be flowy but not too big. Sarah took a look at the pattern and has reworked the scoop of the neck with her final release. So, if you're worried it looks too low, it's been adjusted. So now it's your turn! Go ahead and grab this dress, a staple for anyone on the go wanting to look put together when really you only had 5 minutes! 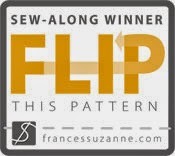 Congrats Sarah on an great pattern, and thanks again for granting me the honour to help test! The Gardenia Dress pattern can be purchased here and be sure check out her facebook page here to grab your 20% discount until Sunday, October 12th 11:59pm EST (Monday, October 13th 1:59pm AEDT). !